Elvis Presley was perhaps the most popular singer and the greatest cultural force in the 20th century. Often referred to as “the King of Rock ‘N’ Roll”, he is single-handedly credited with popularizing rock & roll on an international level. During his career Presley had numerous hit records, and massive crowds attended his concerts. Having sold around 1 billion records across the world, he is the best-selling solo artist in the history of recorded music. 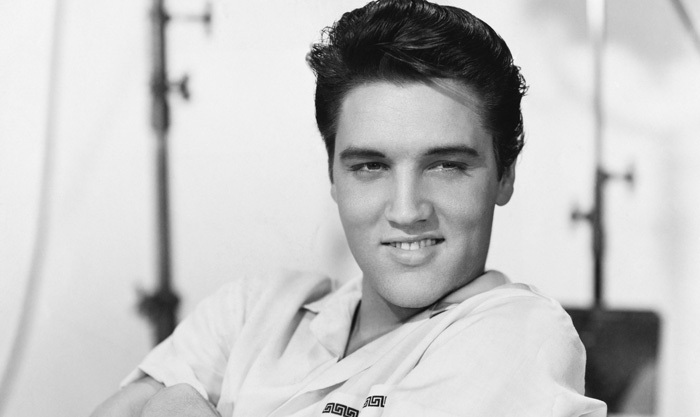 Born “Elvis Aaron Presley” in a tiny apartment in Tupelo, Mississippi, he belonged to a poor household. His father, Vernon Presley, held various odd jobs and the family often relied on social benefits. Elvis appeared on his first radio broadcast in 1947 and sang Red Foley’s 1935 hit “Old Shep” at the age of 10. Elvis secured the second prize for his performance. The following year his mother, Gladys Love, bought him a guitar for $12.95. The Presley family relocated to Memphis in search of a better life in 1948. Elvis, just like his father, worked several odd jobs after graduating from high school. In 1954, the prominent music magnate Sam Phillips called Elvis for an audition through his assistant, Marion Keisker. Elvis sung several song but Phillips was largely unsatisfied with the input until the young singer came up with a sped-up version of Arthur Crudup’s “That’s Alright, Mama”. He also recorded Bill Monroe’s “Blue Moon of Kentucky” and these two number turned into two of the five early smash hit singles for Sun Records. Elvis would become the world’s most recording artist within just two years under the shrewd management of Colonel Tom Parker. After a short stint with the army, he started recording again in 1960. Elvis starred in a number of unimpressive motion pictures during the British Invasion era when the Beatles were at the height of their success on the United States music charts. Although his fans remained loyal and helped push his worldwide record sales to more than 200 million shipped units, he was the forgotten giant of Rock ‘N’ Roll by 1970. Elvis slipped into a sedentary lifestyle in late 1976. He suffered drug problems and gained significant amount of weight. His infamous return to stage received negative audience responses as the overweight Elvis often panted between the songs, stumbled across the stage, and even forgot the song lyrics while performing. Elvis was found dead at 2:30 in the afternoon by girlfriend Ginger Alden on January 8, 1935. He was officially pronounced dead from cardiac arrhythmia at 3:30 pm at Baptist Memorial Hospital, North Mississippi. Originally buried at Forest Hill Cemetery, Memphis, his body was moved to Graceland where his funeral was held on August 18. Elvis was only 55 years old at the time of his death. Elvis Presley earned numerous accolades and accolades in his lifetime, and has been posthumously awarded many more. A few of them include three Grammys (he received the Grammy Lifetime Achievement Award at age 36), three Laurel Awards, the Award of Merit by the American Music Awards, and several NME Awards. He has been inducted into multiple music halls of fame: the Rock and Roll Hall of Fame (1986), the Country Music Hall of Fame (1998), the Gospel Music Hall of Fame (2001), and the Rockabilly Hall of Fame (2007). One of the most important social icons of the 20th century, Elvis Presley was unusually conservative in his personal life. Presley married 21-year-old Priscilla Ann Beaulieu in 1967 at the Aladdin Hotel in Las Vegas. The couple were divorced after just six years. Presley’s only child, Lisa Marie, was born in 1968.